Fondues seem to be all the rage this winter! 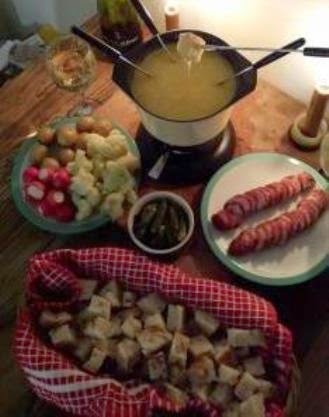 Fork & Flame, who are Alex & Jimmy, two university friends, are organising a series of fondue supper clubs at Nineteen in Lonsdale Road NW6, named after the Le Caquelon - the traditional communal fondue pot. The first night sold out - don't miss your chance to attend one of the next ones! "After a sell-out debut in April, be ready for another mouthwatering dose of fondue and a decadent array of artisan ingredients! We bring you ‘Le Caquelon’ - indulgent fondue nights to stave off the winter cold and satisfy your hearts’ cheesiest desires! What sets these events apart is a focus on the quality of the ingredients rather than the usual Alpine frippery. All the food will be sourced from the Jura Mountains in Eastern France, home of the caquelon - the traditional fondue pot of culinary legend - and London's own Borough Market, where your hosts are traders. Showcasing affineur Marcel Petite's delicious Comté cheese, the main act on the night will be an oozing, intoxicating, sumptuous cauldron of fondue made with outrageously delicious aged Comté, accompanied by smoky, succulent, handmade saucisse de Morteau, sourdough bread, crunchy vegetables and pickles. This is a fully-waitered event in a characterful and atmospheric venue in the heart of Queens Park’s, Salusbury Road area. Fondue is a really sociable way to eat, and diners can book to sit with friends or buy single tickets to sit with new friends on our long communal tables of 8 - 12. There will be a range of selected beers from London's The Kernel Brewery and wines available on the night at very affordable prices (house wines for £12 per bottle, beers from £3)."